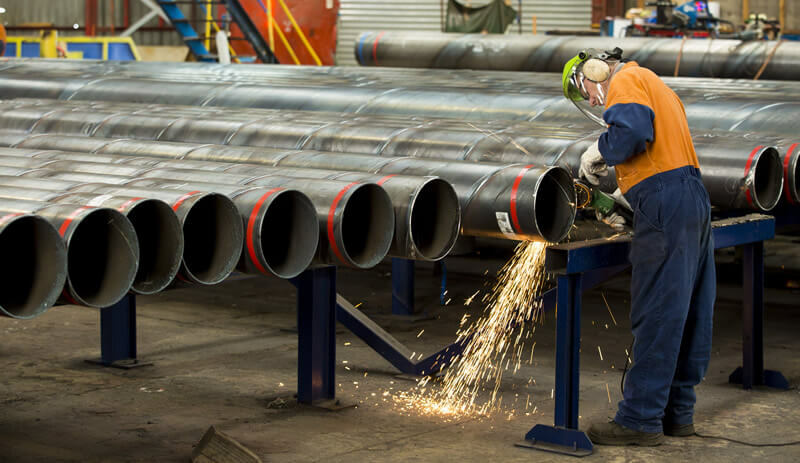 Steelpipe manufacturing facility is in Auckland, New Zealand, ensuring quality, locally produced pipe is available to suit both project lead times and delivery timetables. We have three spiral welding mills in at our Onehunga facility. Each of these mills specialises in a different size range, from 177mm to 2000mm Outside Diameter (OD). Steelpipe uses the submerged arc welding (SAW) procedure to weld the seams of the hot rolled coil, while deflecting the plate on the exact angle to produce a perfect pipe, every time. We test the integrity of the pipe and weld through a combination of hydrostatic and ultrasonic testing. The steel is spiral formed and welded, both internally and externally, using the automatic submerged arc process, strictly in accordance with internationally recognised standards. Steelpipe applies the Polyken YGIII three-layer system, and Synergy heat activated system in-house. A range of other painted solutions are also available. We apply Berry Plastics Corporation Polyken Corrosion Protection Systems YGIII and Synergy Heat bonded products in-house. We can also offer painting and epoxy coating systems. Steelpipe has a state-of-the-art concrete lining plant, commissioned in 2012, that produces quality linings per NZAS4442 Potable Water Standard. A durable, cost-effective, time proven choice for protecting steel pipe interiors for over a century. These are appropriate for above or below-ground applications in all water transmission scenarios. Concrete is centrifugally applied to straight pipe 345mm through 2020mm in outer diameter and up to 12 metres in length using our custom-designed and built state-of-the-art equipment. Automated weigh batching and operator controls ensure proper and consistent mix, density, strength and quality.